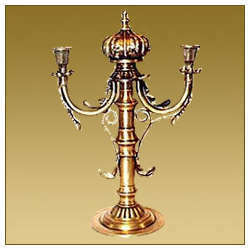 Leading Exporter of four candle holder with flower design, candle holder with leaf cut and candle holder trophy design 5 candles from New Delhi. 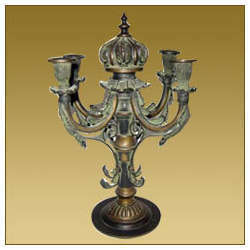 Four candle holder w/flower design, offered by us are beautifully designed in both brass & bronze metals. The superior crafting standards followed by us ensure that these display exquisite beauty of metal crafting we are known for in the global markets. Further the services of experienced craftsmen also allow us to deliver these in specific designs and finish requirements as specified by the clients. 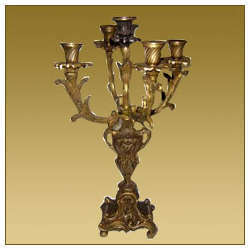 Candle holder offered by us feature ethnic designs and floral patterns. We can also offer these in lacquered designs that varies either in form of varnishing offered in entire body or a part of the item. The process expertise of our craftsmen also allow us to deliver these in `koftagari` art work, which allow us to deliver in these stands a pleasant and aesthetic mix of brass and bronze metal. We offer candle holder for 5 candles in trophy designs. Our in-depth process knowledge also help us to provide in them "naquasi" artwork style in which metal item is oxidized to make carved designs stand out from background. Further, its bright and beautiful artwork also makes them great addition to any living spaces.